Continuing from yesterday…. A little more information about Menelaus of Alexandria can be got from Roshdi and Papadopoulos’ introduction, although not without effort. 37. Istikhrāj al-awtār, in Rasā’il al-Bīrūnī, Hyderabad, 1948, p. 49. One’s heart sinks, doesn’t it? What’s the chances of getting hold of an Arabic work printed in Hyderabad in India? And a Google search gives you nothing. Anyway, I couldn’t read it. German translation based on the Leiden ms.: H. Suter, Das Buch der Auffindung der Sehnen im Kreise, Bibliotheca Mathematica Dritte Folge, 11 (1910-11), 11-78, reprinted in IMA 35, pp. 39-106, reprinted in Suter, Beiträge vol. 2, pp. 280-347, scan, another scan. Yes, the links to “scan” are PDFs of the article! And the volume of Bibliotheca Mathematica 11 (1910) is online at Europeana here. In fact Hogendijk also tells us that the manuscript is “Leiden Or. 513, 108-129”, and provides a scan of photographs! This is such a valuable site! So we can now see what al-Biruni had to say about Menelaus of Alexandria. It’s on p.31 of Suter’s article. 1. Es sollen aus zwei gegebenen Punkten zwei Gerade gezogen werden, die einen gegeben en Winkel miteinander bilden, und deren Summe gleich einer gegebenen Geraden ist, von mir. Menelaus wollte im zweiten Satze des dritten Buches seines Werkes über die Elemente der Geometrie beweisen, wie in einem gegebenen Halbkreis eine gebrochene Linie gezeichnet werde gleich einer gegebenen Linie; er schlug aber hierzu einen sehr langen Weg ein. (1) Nachher behandelte sie (diese Aufgabe) Thäbit b. Kurra in seinem Kommentar dieses Buches (des Menelaus) auf einem ungefähr so langen Wege wie Menelaus selbst. Nachdem nun aber die Eigenschaften der gebrochenen Linie bekannt geworden sind (2), so ist die Behandlung dieser Aufgabe des Menelaus eine leichtere geworden, und sie erstreckt sich nun sogar allgemeiner auf alle Bögen eines gegebenen Kreises (nicht nur auf den Halbkreis). 1. Let us draw two straight lines from two given points, which form a given angle with each other, and whose sum is equal to a given line, by me. 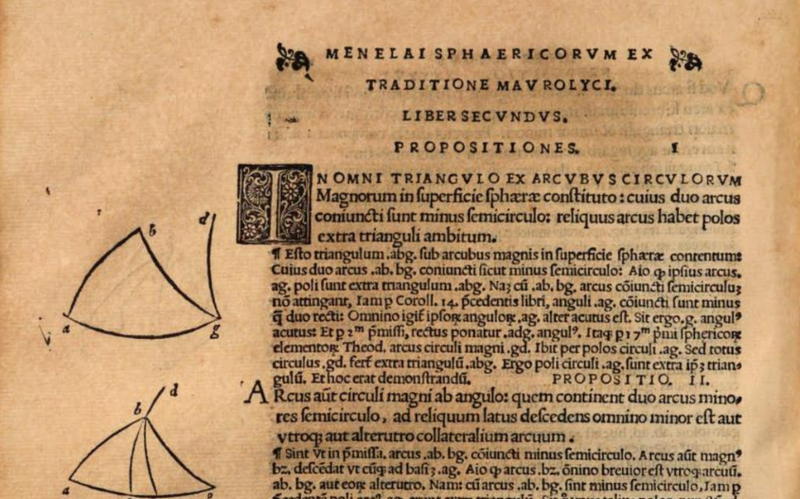 In the second section of the third book of his work on the Elements of Geometry Menelaus wanted to prove how a broken line is drawn in a given semicircle, equal to a given line; but he took a very long journey for this purpose. (1) Afterwards Thabbit ibn Kurra treated (this proposition) in his commentary on this book (Menelaus) with a pathway as long as Menelaus himself. Now that the properties of the broken line have become known, (2) the treatment of this task of Menelaus has become easier and extends now even more generally on all arcs of a given circle (not only on the semicircle). The footnotes are just references to studies. Well, it doesn’t tell us very much in truth. It confirms that Menelaus’ lost work on The Elements of Geometry did survive into the 9-10th century, and was in the hands of the translators in Baghdad, and was in at least 3 books. We know from elsewhere that Thabit ibn Qurrah translated it into Arabic. Still, it’s nice to get this far. Even the baffling reference could be elucidated, with a bit of ingenuity and the use of the world-wide web.